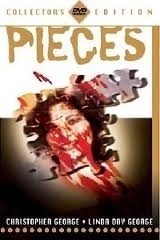 “Pieces” is another blood soaked cult classic from the golden year of 1982 that brought us such classics as Creepshow, ET and my birth. That last one is less popular than the first two, but without it you wouldn’t be reading this incredibly late review, so that’s something I guess. 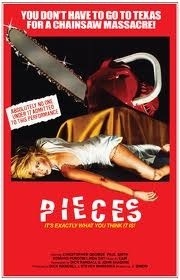 It’s been awhile since I’d seen “Pieces”, does it still hold up ? The plot begins with a child who is caught by his mother as he assembles a jigsaw puzzle of a naked woman. She flips out, hits him and starts searching through his toys for more contraband material. In turn, he axes her to death, chops off her head and concocts a story when the cops show up. Flash forward 40 years later as a string of murders begin at a local college. Who did the little boy grow up to be ? Can the police catch him in time ? What is he using the “pieces” for ?! This is a super gory little romp that accomplishes exactly what it sets out to do. It’s over the top, ridiculous and keeps you guessing as to the killers identity. I’d never seen it until I bought the deluxe DVD that Grindhouse Releasing put out a few years ago. I’d enjoyed it, but later sold it anyway. Later I got the urge to revisit it and I’m glad I did. While I can’t say I’ll buy it again, for fans of gory 80s Giallos I highly recommend this film. It’s gross, dirty, ridiculous and non sensical in parts (like the random appearance by a Brice Lee impersonator) but that’s part of its charm. It also features an insane “twist” ending that will have you wincing. For most casual fans this wont be your cup of tea, but if you’re into this kind of flick its definitely deserving of its cult status. This entry was posted in Reviews and tagged 2012, 80s, blood, chainsaw, classic, cult, cut, gem, giallo, gore, guts, Halloween, Horror, killer, knife, murder, mystery, October, pieces, review, slasher, thriller by lazron. Bookmark the permalink.